Count on the quality, experience, and expertise of Renewal by Andersen® of New Jersey-New York Metro for all your replacement window needs. 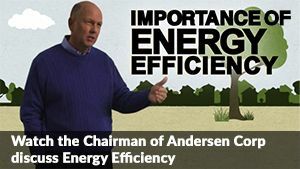 Renewal by Andersen has replaced more than two million windows in more than 300,000 homes. Whether you need to replace one damaged window or a houseful of windows in disrepair, we have the experience and the skill to help. When you turn to us for window replacement, you will work with our experienced design consultants to choose the ideal fit for your home. We offer a wide selection of traditional and modern window styles and can customize each to match your home décor. Each replacement window we install utilize Renewal by Andersen’s exclusive Fibrex® material, a versatile material that offers the strength and insulating value of wood with the low maintenance features of vinyl. Fibrex material never requires painting and will not crack, pit, corrode, or rot. * It’s unique fabrication process blends the color with the Fibrex material during production for long-lasting beauty. Thanks to revolutionary Fibrex material and Renewal by Andersen’s exclusive High Performance™ Low-E4® SmartSun™ glass, which is 70% more energy efficient in summer and 45% more energy efficient in winter as compared to ordinary dual panel glass,** Renewal by Andersen windows will save you money on your monthly energy bills. Think about it. The money you will save can be put towards further home improvements or stashed away for a rainy day, it will not have to go towards heating and cooling your home. In addition to energy efficient windows, we also install a selection of Andersen patio and sliding doors. To learn more about our doors and to schedule a free, in-home consultation on door or window replacement, give us a call at (908) 497-1020. Homeowners in Jackson, NJ, can also fill out our convenient online request an estimate form today!